1.) Doors open at Noon (no earlier) and the sale ends at 4:00pm (no later). If you want to shop you need to get there before 4. 2.) Most everything is $7 and under and prices are fixed! There will be price sheets listing prices by item type posted throughout the hall. There is no bargaining or special deals. 3.) We DO NOT accept checks. We take cash and credit cards for purchases and cash only for door and bake sale donations. 4.) While we will have some bags at the register, it is helpful if can you bring your own to to pack up your fashion scores. 5.) The entrance to the sale is on 28th St. See event information for the full description of the entrance and for full accessibility information. 6.) We CANNOT take clothing donations at the door. 7.) We have many volunteers working the sale who are there to help you shop and generally help you have a fabulous day. If you need any assistance find someone working the floor with a name tag on and they will be more than happy to help you! 8.) The more the merrier, so bring your friends! Cupcakes and Muffintops 6.0 is coming your way August 3rd in Oakland! It’s the most wonderful time of the year around here for fat fashion! 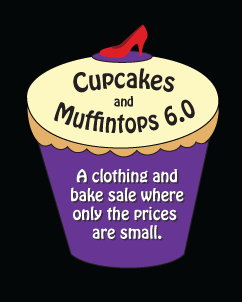 That’s right, it’s time for Cupcakes and Muffintops 6.0, the fat-friendly, gender-inclusive clothing and bake sale happening Sunday, August 3rd, 2014 from Noon-4pm at The Humanist Hall in Oakland, CA. Come on out for the Bay Area’s biggest fat fashion extravaganza of the year and spend the afternoon in the company of some of the most gorgeously courageous, enthusiastic fat folks around, egging each other on to buy that tight leather vest or try on that bikini. Come sample delicious homemade treats and come in with a reasonable amount of cash, and leave with armloads of new-to-you clothes you can’t wait to wear Presented jointly by Big Moves, friends of NOLOSE, and the Fat Friendly Funders, we’re so proud that this bonanza of fat fashion and fellowship is becoming a Bay Area institution. It’s never too early to clean out your closets for great fat causes! We’re currently accepting donations of gently used clothing for people of all genders, size large and up, up, up! Superfat and masculine-spectrum clothing especially appreciated. Send an email to cupcake@bigmoves.org schedule a donation pickup, volunteer to help at the sale, or sign up to bake some goodies! Accessibility Information: The entrance to the sale is on 28th Street, through the garden. There is a small parking lot on the side of the garden towards Telegraph Avenue, and we ask that people leave the parking spaces in the lot for people who need closer, more accessible parking. Once in the garden, there is a path down to a ramp on the left; the ramp is the main entrance to the sale and will be festooned accordingly. Inside, we’ll have some armless seats and volunteers on hand to help you shop, carry clothes, etc! The Humanist Hall has two gender-free bathrooms, one of which is accessible but may have a sink-height issue. The shared dressing room is also gender-free.